Note: gauge is not critical for this project. Using closed CO method going L to R, CO 100 sts, leaving a 6" end of yarn. COR. RC=000. BO leaving long tail of yarn for gathering. Using small running stitches and the long yarn tail, sew in and out of the stitches along the BO edge and gather until that edge measures approx 5". Secure yarn and weave in end. Lay piece down with knit side up and the rolled edge on top, rolling down toward you. 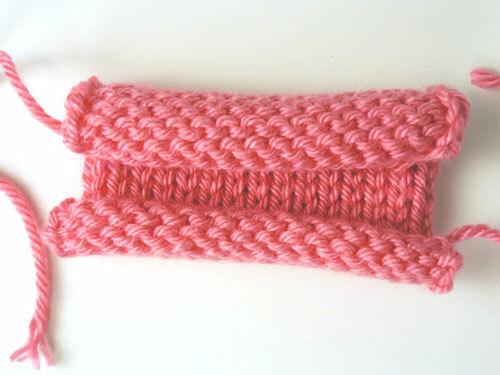 Arrange piece so knit side is facing you and with the edge rolling to the front. 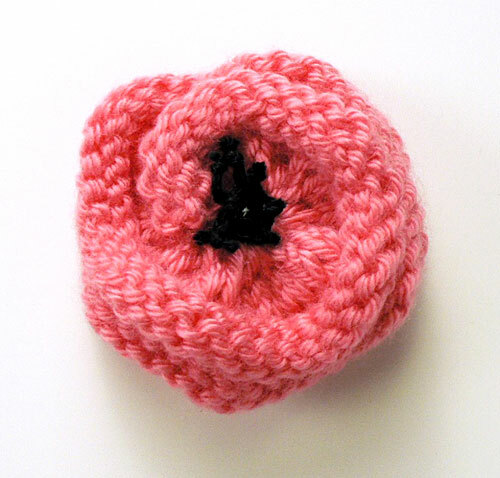 With short tail of yarn on top, work piece into a flower shape by turning the knitting in circles. Pull the yarn tail that’s on the top through the center through all thicknesses to the bottom. Secure yarn end and weave in end. Cut black yarn into four 4” long ends. Knot the yarn close to one end. 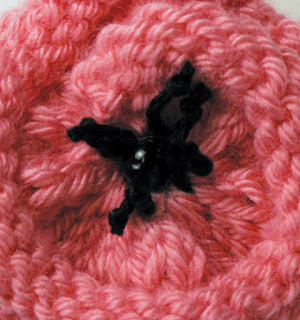 Thread tapestry needle with opposite end and weave through center of flower (using photo as guide) so that a ½” of yarn plus the knot show on the top. Make a second knot ½” from the flower and cut off yarn. Secure yarn stamens with fabric glue or sewing thread. Sew or glue bead to center of flower. 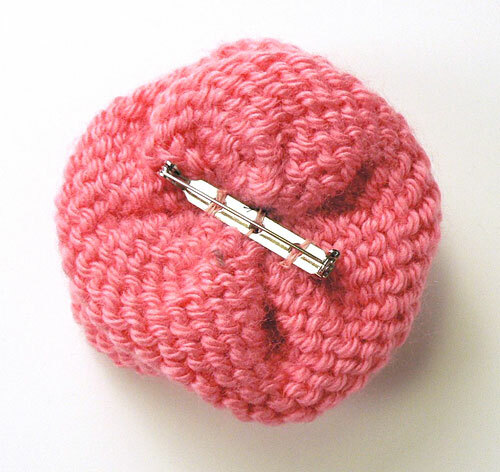 Sew pin back to center back of flower or sew flower directly to a project such as a pillow, sweater, jacket or gift box. Be creative!